If success with any paint job starts with the surface prep, the same rule goes double for metals, and triple for outdoor metalwork. The good news is almost any metal around your house—including rusted metals—will hold paint, provided you do three things: 1) prep the surface thoroughly, 2) use the right primer and paint for the material, and 3) follow the directions on the paint cans. TIP: So that you’re able to complete item 3 without having to go back to the store, pour out the primer and paint on the front side of the can, so you don’t slop paint all over the directions. This is an incredibly easy mistake that’s even easier to forget. 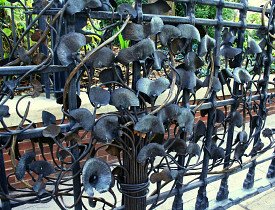 Whether your outdoor metal work is “iron” railing (which may be iron, but more likely is steel), gutters (probably galvanized steel or maybe aluminum) or a full-size copy of Rodin’s Balzac sculpture (bronze, but check with your art dealer first), start by finding a high quality outdoor metal primer made for your type of metal. If the surface is rusty, be sure to choose a rust-inhibitive primer (or just ask for the best “rusty metal primer”). Next, choose a paint with the desired finish properties (enamel, satin, etc.). And this is critical: The paint must be compatible with the primer. In order for the paint job to last, the primer has to stick to the metal, and the paint has to stick to the primer. If you know ahead of time what paint you want, you can, of course, work backward and choose a primer that works with the paint and your metal. TIP: If you’re buying regular (brush-on) primer and paint in the can, have them shaken in the store, even if you’re not adding color. A thorough mix is essential to proper performance, and, as James Bond will remind you, shaking is better than stirring. This is when you start following the manufacturer’s instructions. You also might want to check their website or call their technical hotline for specific recommendations. For most exterior painting of metalwork, the general prep involves removing corrosion and rust with a wire brush and/or steel wool, then sanding all surfaces with medium-grit sandpaper (a sanding sponge works well for contours). Clean the surface with a tack cloth -- or as recommended -- before priming. Some manufacturers may recommend cleaning galvanized metal and aluminum with a degreasing cleaner to remove residue and oxidation. In any case, it’s usually best to apply your primer the same day that you prep the metal. Primers and paints for outdoor metalwork come in standard formulas for brushing, rolling or power-spraying, as well as in aerosol spray cans. For anything large, such as gutters, siding or kit sheds, standard paint is best. For detailed items, like furniture, lanterns and railings, spray paints and primers make it easy to achieve a smooth finish without muddling the fine detail. With any paint or surface, it’s recommended to use a brush for rough spots and welds, to make sure the paint gets into all the tiny nooks and crannies—because if you don’t get in there, water surely will.